Whether you fall or fail, whether you cry or sob, all you can look forward to is that your dad believes in you. He picks you up, lifts you up, brushes you off, and lets you try again. “Dada” was the first word my daughter Kimberly uttered. I was prepared. I had learned from pediatrician Dr. Dan Taylor that the sound “da” is much easier to form than the much more complicated “ma”, and that babies usually save “the best for last”. That consoled me, somewhat. As a stay-at-home mom for the first few years, I worked tirelessly, but oh, wait a second, this article is not about moms, it’s about dads. OK. You see it’s not so easy to switch gears, because our society has been oriented toward mom as the predominant child-rearing parent. 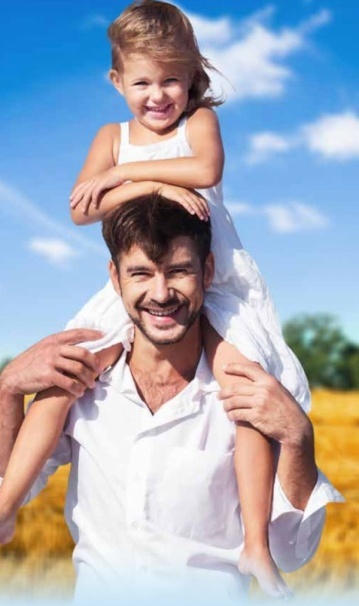 But alas, change is underway and Rachael Feintzeig in The Wall Street Journal shares that, “Fathers feel greater job satisfaction and less work-life conflict when they spend more time caring for their children, according to the study, which surveyed 970 fathers in a variety of occupations. And men are less likely than women to feel friction between work and home life when they devote more time to child care, the study found. Working fathers often get mental bonus points for helping out with the kids. Colleagues and managers think, “good for him, he’s such a good dad, he’s leaving at 4:30 to go pick up his kids”. The more time the men reported spending with their children, the more likely they were to think their work enriched their home life, agreeing with statements like “my involvement in my work helps me to acquire skills and this helps me be a better family member”. More time spent with children also was associated with a lower likelihood of the men quitting their jobs. This research was published in the February issue of the Academy of Management Perspectives. Yet, when I take stock as a mother, I realize I had to make room for Daddy, and I sure am glad I did. As the mother hen, aka the family control freak, I had to learn that I could trust Dad to introduce his special qualities into the children. His capacity for seeing the larger picture, lifting their spirits because he had a fresh perspective, offering a solid sturdy hand and unencumbered playtime made Dad extra special. Dads have the potential to make the world go round for a child. I know my own dad did. He was the most brilliant person I knew, and I could count on him to open new realms of knowledge, wisdom and exploration. I can still remember him telling me that one day I would be able to see the person I was taking to on the phone. “Yes, Elizabeth, it’s way in the future,” he said in 1970. And the future is here. He also told me we would put money in a box next to our TVs and be able to watch movies at home. Well, we’ve come a long way, and I’m happy to say, Dad was right. It’s great to look back and reflect on how the role of dad has both changed and stayed the same. There’s one thing that we can still rely upon… and that’s ‘Dada’ for sure!